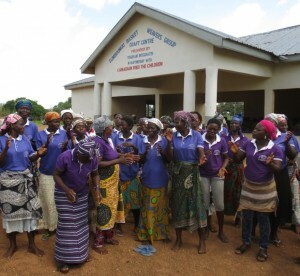 Canadian Feed The Children’s (CFTC) partner TradeAID Integrated was the driving force behind the 2014 declaration of Bolgatanga – a town in the Upper East Region of Ghana – as the second Fair Trade Town in Africa. Today, TradeAID’s leadership has helped community crafts people protect and promote their economic rights through a variety of fair trade initiatives upholding that status. In 2014, Bolgatanga joined the township of New Koforidua (also in Ghana), as the only two towns in Africa to have successfully passed the application process. 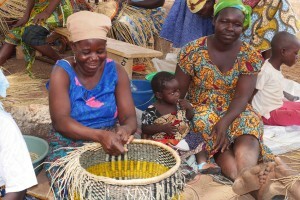 With support from CFTC, including the recent development of a new craft centre for the areas basket weavers, TradeAid has worked to improve the lives of craft producers in the Bolgatanga area through activities designed to build capacity and provide access to free and fair markets. Sumbrungu’s new craft centre, built with support of CFTC donors. stands to gain many benefits from the fair trade declaration – including local producers earning fair profit, increased access to local and international markets, and the ultimate goal of stronger economic activity and quality of life for those living there. a Fair Trade event to promote local businesses and fair trade locally, regionally and internationally. As part of this agreement, TradeAid was the leader behind the 2015 Bolgatanga International Craft and Arts Fair that took place November 12 – 15, 2015. It showcased the products and talents of local people in the Upper East Region of Ghana. 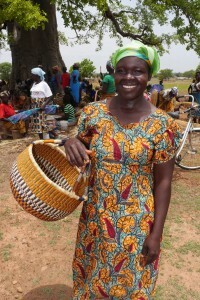 The event, held in a nearby park, was free for the local community to attend and provided an opportunity for local artisans to sell their work in accordance with fair trade. It included workshop sessions teaching craftwork, a raffle to win craft prizes, entertainment by local troops and music groups, and a celebration of the benefits of fair trade and economic development.